The process of Lean thinking is an improvement methodology that has now become a global phenomenon. Though initially it started off in the manufacturing process, it has now commonly deployed across other sectors and has helped delivering both organizational efficiencies and customer satisfaction. The principles and tools of Lean management help create customer value and also help produce goods with lesser defects and better quality, at the same time eliminating the unnecessary 7 wastes and lesser capital. Let us understand how to take these lessons to our warehouse and distribution centers. FLOW- the primary objective of lean warehousing, contests us to improve the materials flow through the distribution center or warehouse. An ideal situation is where the demand from a customer is responded to immediately and this is the major challenge for any warehouse. This process is called “Pull”. Creating an optimal warehouse layout is a critical factor in creating material flow, whether inbound or outbound (to customers). The Japanese principles of 5S can be employed for designing the functional areas, inventory, methods of storage and many warehouse processes. It is a very basic tool and relates primarily to housekeeping. But applying these Japanese Principles under macro guidelines, it can be extrapolated to warehouse managements as well. By using these principles, picking routes can be optimized and errors can be minimized. Under Lean warehousing, the main objectives are low inventory, less space, and human efforts. This will lead to less capital, lower operating costs and lesser investments in storage and handling costs. 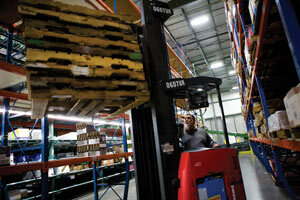 Lean warehousing can lead to lower delivery times and better customer response time. The spirit of Kaizen must be employed in every organization, which could become the difference between you and your competitors.